Once upon a time, SUVs as we know them today, were the domain of farmers, rural dwellers and off-road enthusiasts. They sat tall on the road and usually on big, thick, knobby tyres that rumbled on the sealed road and dispensed with off-road detritus with ease. We called them bush-bashers, four-wheel-drives or, when feeling mean towards the few who did buy them exclusively for urban living, Toorak Tractors (for Melbournites) or, if you lived in Sydney, North Shore Tanks. 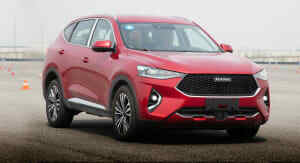 But as the buying public’s tastes changed, so too did the design and refinement of SUVs, so much so that today, the segment is one of the fastest-growing new car markets in Australia. 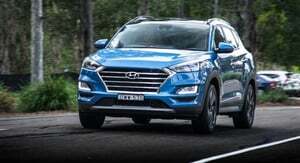 It’s come at a cost though, with few of today’s models designed with serious off-roading in mind. Hell, some models don’t come with four-wheel-drive as standard while others don’t feature all-paw traction in their ranges at all. They are, in short, designed specifically for urban terrains. 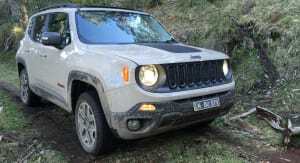 There are exceptions, and the 2016 Jeep Renegade Trailhawk is one of them. 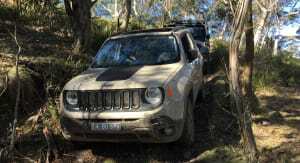 It’s well-equipped to tackle some fairly tough terrain. So we thought we’d give it a good old-fashioned bush bash to see how it stacks up. 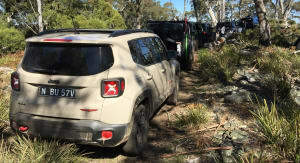 While the lower-spec Renegade models are more at home around town – the Sport, Longitude and Limited are all front-wheel drive and have running clearances of 161mm to 176mm – the Trailhawk is trail-rated and has Jeep Active Drive Low which is a four-wheel drive system with single-speed power transfer unit. 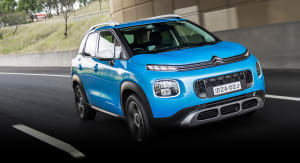 It also has hill descent control, terrain select, 17-inch off-road alloy wheels, underbody skid plates and a running clearance of 211mm. 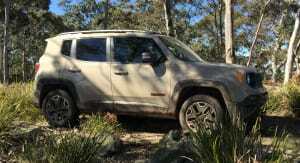 The Jeep Wrangler is an incredibly capable 4WD and when you look at both of them, compared to the Wrangler, the Renegade doesn’t exactly scream ‘get me off the bitumen’. 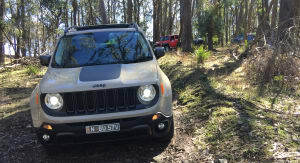 Visually, even though the Trailhawk has trail-rated badging, a tough looking black grille, black anti-glare hood decal and a red tow hook at the rear, the overall body shape and style puts it well within the realm of soft-roader SUVs. So, naturally, we just had to verify it’s off-road credentials for ourselves. Fun! 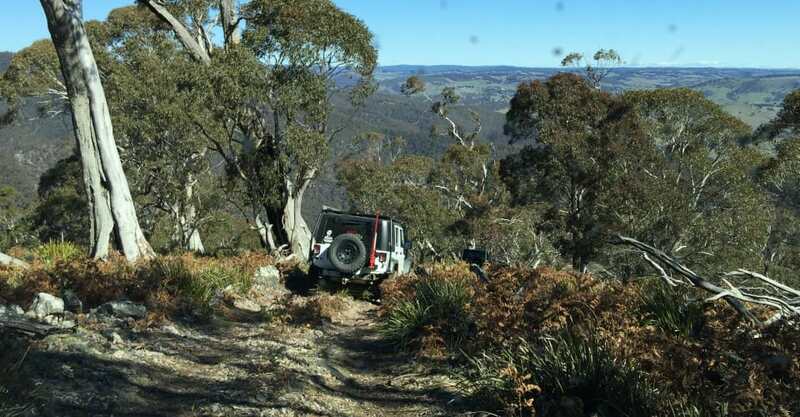 A couple of years ago I joined the Sydney Jeep Club on a run around Rydal in the special edition Jeep Wrangler Freedom. It was a great way to put the car through its paces in a safe, fun, educational and supportive environment. So what better environment to, this time, test the limits of the Renegade. 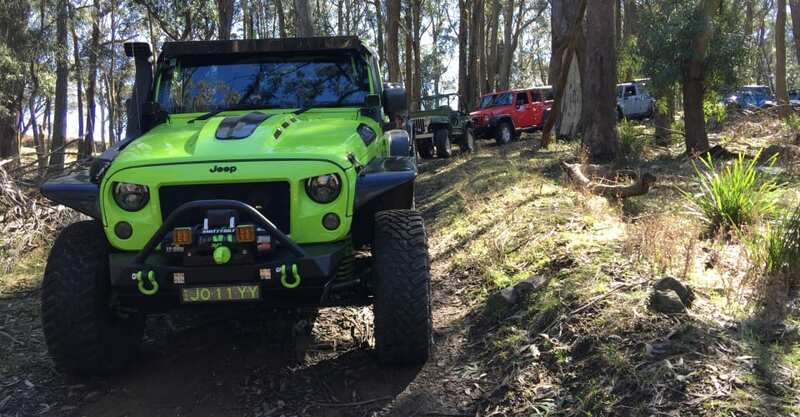 Being a new model, the Sydney Jeep Club were just as keen to see it in action, as I was to find those limits. They had planned a run around the Hampton State Forest, following fire-trails heading up and around Mt Bonfire. It wouldn’t be a difficult run, but there would be enough mud, ruts, rocks, hill ascents, hill descents and obstacles to challenge this as-delivered, unmodified Jeep. I caught up with the crew at South Bowenfels, around three hours outside of Sydney. 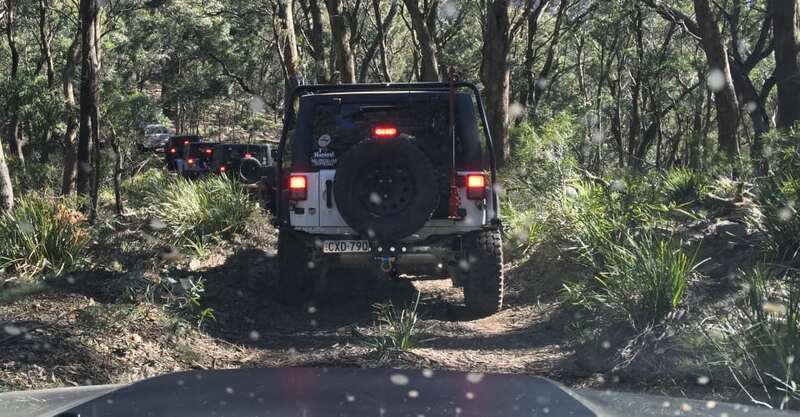 It was a big turnout, with 15 Jeeps ranging from straight-off-the-lot Cherokees to old Willys’, and some highly modified and brightly coloured rigs, their owners plus passengers. 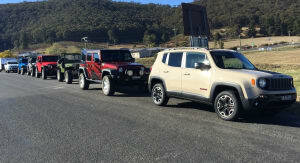 The Renegade attracted a lot of attention from the outset. The Mojave Sand exterior colour was either loved or hated, but the interior finish with its bright pops of colour, BeatsAudio sound system and leather seats was a hit amongst the brand’s aficionados. 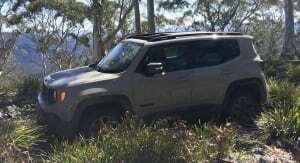 The Renegade Trailhawk is priced at $39,000 before on-road costs and ours had a few added extras – pastel paint ($500), sunroof ($1900), lane departure warning ($500) and parallel and perpendicular parking assist ($500) bringing the as-tested total to $42,400. After getting the cars prepped to venture out, checking radios and securing loose objects, the convoy got moving. 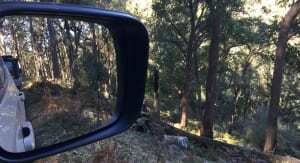 As we crept further into the bushland we paused to engage low-range and the real 4WDing began. The trail quickly became steeper and more gnarled. It was also quite narrow and the safety alerts were going off almost constantly to the point where it felt like I was suffering from sudden onset tinnitus. 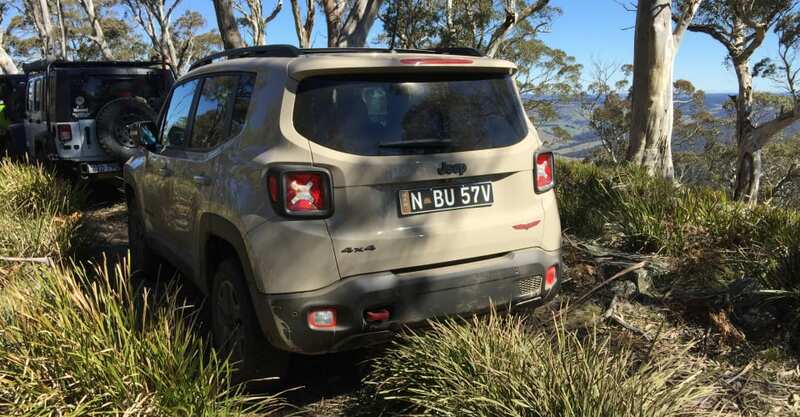 The Trailhawk is fitted with rear parking sensors, blind spot monitoring and a rear-view camera. The sensors trigger directional audio alerts in the cabin, so if there’s an obstacle to the left, the sound plays through the left speakers and vice-versa. This is awesome in traffic and when parking, but had to be switched off in this scenario because every tree and rock was setting it off. Annoying. After sorting that out, it wasn’t long into our trek that we came across the first of what would be many obstacles. A large tree had fallen across the trail, most likely the victim of recent storms that had passed through the area. I wasn’t sure what the club members were going to do. There was no way to get even one car over or around to help from the other side and the group seemed to be filtering off back to their vehicles. 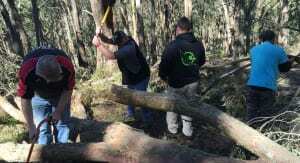 Rather than give up and turn around, they were determined to move it out of the way and returned to the fallen tree armed with axes, saws and even cordless tools. Bit by bit they trimmed, until they could use recovery gear to drag the main trunk out of the way. With the strap secured to the fallen tree and looped around a tree on the opposite side to where we were stranded, it was then attached to the front extraction point on one of the Jeeps and the slack taken up. A few powerful bursts in reverse – and finally success! 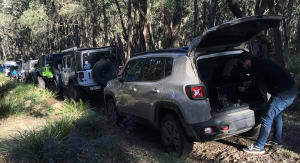 The next part of the drive involved a couple of water crossings, even though there had been a bit of rain recently, they weren’t deep enough to be of any concern to the Renegade. 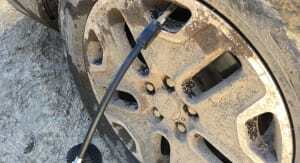 It has a water fording depth of 482.6mm (very specific, yes). We also happened across a few good sections of mud, and I was taking advantage of them to try and get the Jeep as dirty as possible. 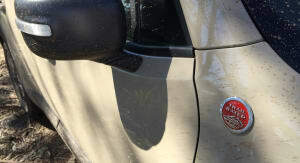 However as the mud dried, it was perfectly camouflaged by the pale colour of the paint. At least the wheels were looking well coated and the black bumpers were blending into the body panels. We stopped every now and again to get some photos and video and started to lag a little behind the main group. If you’re thinking of joining the club, there’s nothing to worry about. The group keep in radio contact and there is someone at the rear of the convoy responsible for making sure no one gets lost by falling too far behind. We caught up to a few of them at a fork in the trail. There were three options – easy, intermediate and difficult. 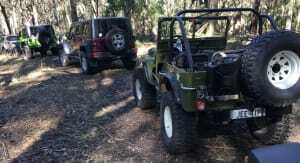 As we pulled up there were two modified Jeeps attempting to get up the really steep difficult track. They’d both hit points where they could go no further and slowly they rolled back to the bottom. It seemed like the perfect opportunity get a direct comparison on how the Renegade stacks up. There was no way it was going to make it all the way to the top if the others couldn’t, but it was worth a shot. The biggest problem was the incredibly loose rock surface, and c.loser to the top there was a massive hump that would get the Renegade into a lot of trouble should we, by some miracle, make it that far. That didn’t seem possible though, so I lined it up and tried to psyche myself up for the attempt. 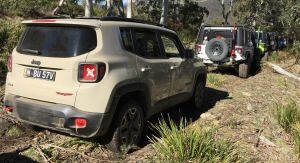 The Renegade Trailhawk has a 2.4-litre four-cylinder petrol engine teamed with a nine-speed automatic transmission. 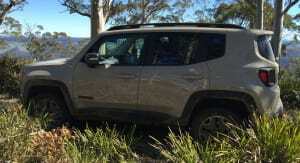 The switch to 4WD low is as simple as pushing a button, as is hill descent control and 4WD lock. 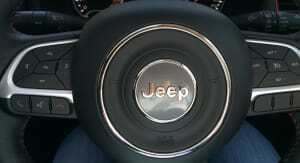 Jeep Active Drive Low has torque management and low range and automatically disconnects the rear axle when it’s not required. The terrain options are Auto, Snow, Sand, Mud and Rock. 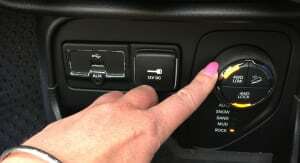 The system optimises the vehicle settings including the torque split, traction control and stability control. I’d already tested out the mud setting and most of the drive had so far been spent in Auto mode. Spinning the dial to Rock, I hit the throttle and powered forward. 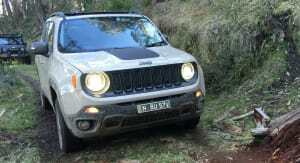 The Renegade is quite light, with a tare mass of 1550kg, and it skimmed over the first section. As it got steeper, I kept the momentum steady and it just kept on going! Just before the dangerous bump, it reached its limit. The wheels were spinning and it wasn’t going any further. After slowly reversing back down, I was greeted by a small but gobsmacked audience. 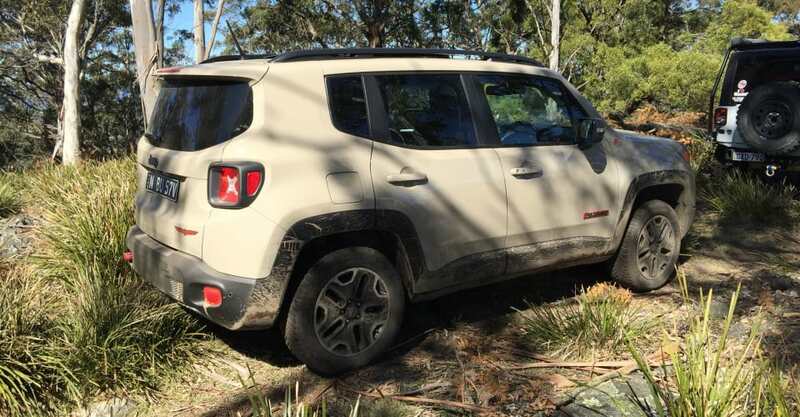 My confidence in the Renegade was growing, and after stopping along a narrow ridge-line with a spectacular view, it was time to tackle the steep downhill run. With hill-descent control helping out, we slowly and steadily made our way down the incredibly twisty path that was precariously carved along the edge of a sharp drop-off. 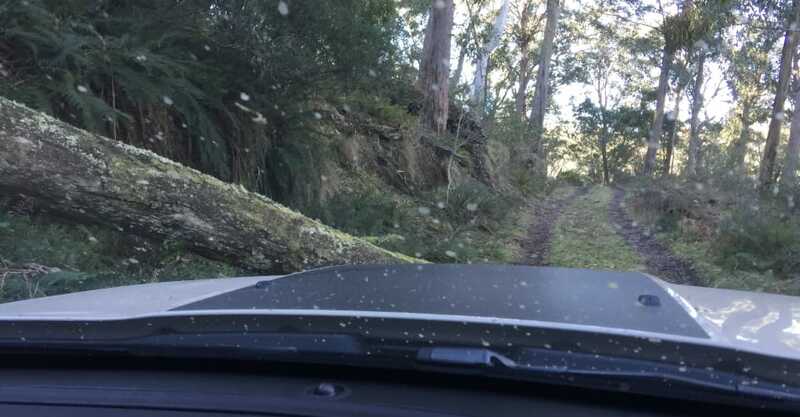 … only to be stopped in our tracks again by yet another fallen tree. The problem this time was it was too big and half-buried to be moved and as there was nowhere to turn around, the options were to either reverse back up the hill, or build a bridge by packing logs and rocks on both sides of the log to smooth a path over the obstacle. The thought of reversing back through that corner was nothing short of terrifying – we simply had to find a way over. Everyone chipped in grabbing logs, sticks and rocks and stacking them up around the tree. Some of the cars with longer wheelbases that weren’t jacked up thanks to heavily modified suspension set-ups came dangerously close to getting stuck on their bellies. More rocks and logs were needed – and with every car that went over the makeshift bridge became more stable. 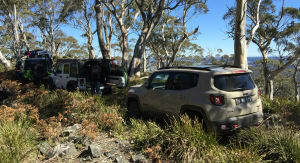 Then it was the Renegade’s turn – it looked too low to handle the obstacle but the experts were confident it would work. The Trailhawk has an approach angle of 30.5 degrees, breakover angle of 25.7 degrees and departure angle of 34.3 degrees. We were going to need every damn second of every minute of every degree. The trick was to creep as slowly as possible, and the crowd of club members were yelling instructions to make sure the wheels went exactly where they needed to be. 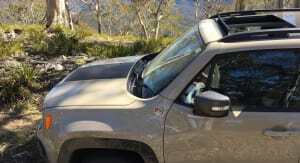 Again, the Renegade’s versatility impressed and we bridged the seemingly unbridgeable and made it through the rest of the drive drama-free. 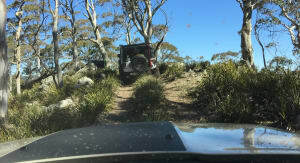 The Sydney Jeep Club was incredibly accommodating. 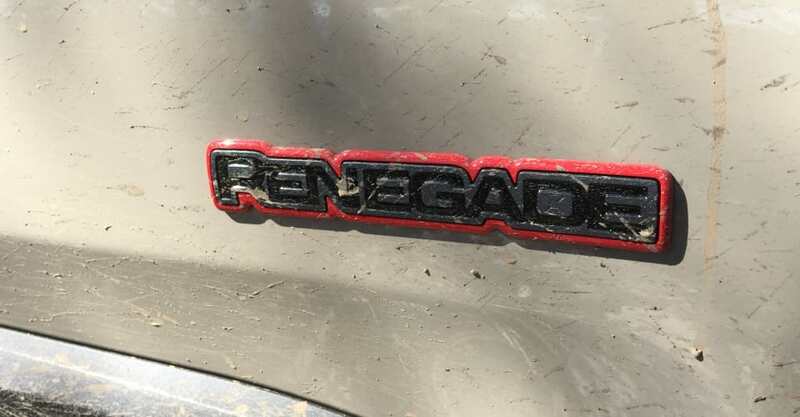 The expertise of its members helped get me and the Renegade Trailhawk through some pretty nail-biting scenarios, and their passion for both the Jeep brand and 4WDing is contagious. 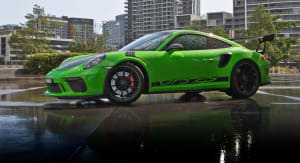 There are plenty of clubs that cater for all makes and types of driving, whether it be off-road, track, rally, touring or simply gathering at a location to check out modified marvels. 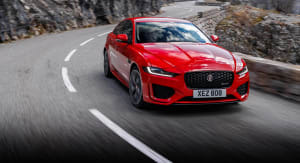 If you are passionate about your car, joining a club is a great way to meet other owners, learn more about your car and its capabilities and get out and explore. Click the Photos tab above for more images by Tegan Lawson and Sam Venn.